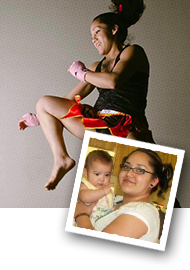 Moe Travis came to KnuckleUp to try Kickboxing to lose weight after the birth of her first child. Once she joined the gym she embraced KnuckleUp’s unique blend of Martial Arts and Fitness Training. She enjoyed her Kickboxing Classes so much that she decided to compete. Here we are years later and she’s a multi time world champion and one of the best Kickboxing Instructors and Fitness Trainers in the world. Having conquered Muay Thai and Kickboxing and dabbled in MMA, today Moe is a Brown Belt Brazilian Jiu Jitsu competitor and is in charge of the KU CrossFit program at KnuckleUp Fitness Buckhead / Sandy Springs.